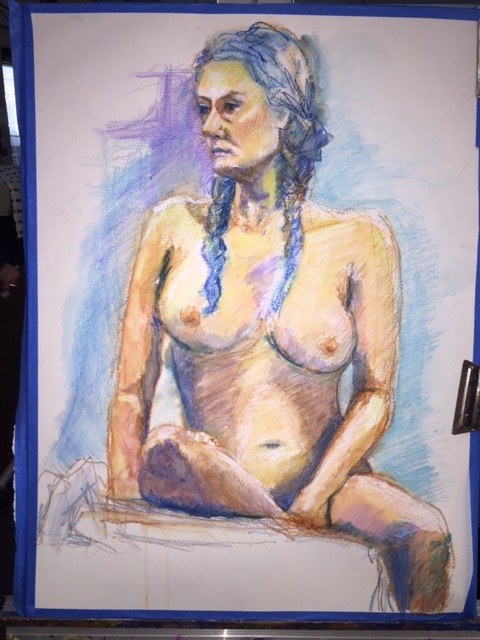 Tom, Ruth and I made our weekly trek to lifemodeling today. I used caran d’ache and fabriano watercolor. I wasn’t too thrilled with my view of the model. Mostly her head but glad to say she turned out looking better than I ever thought my view of her would look. Usually drawing from a foreshortened angle is tough but for some reason I did her correctly today. I liked the way she looked at our first break. 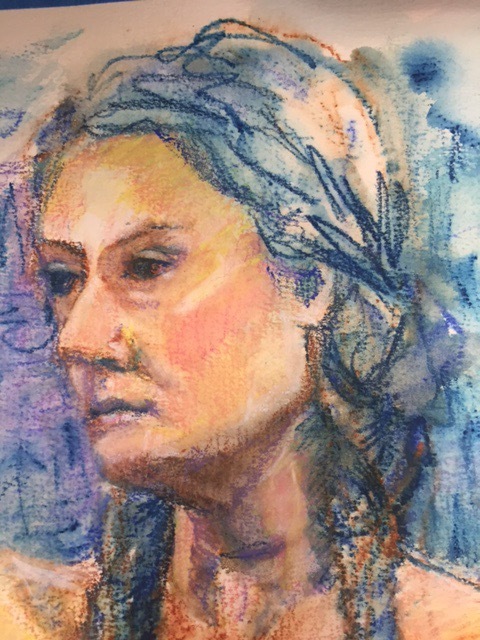 I drew her with yellow ochre. Scrubbed out the incorrect lines with my old Grumbacher filbert hog bristle brush. It’s also great to lift color with. This is after another half an hour. And she’s done for the moment. Still a bit more to do like the background and a few shadows. 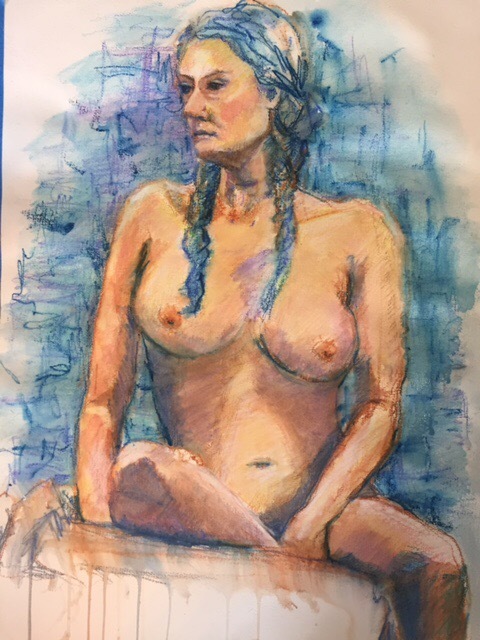 I almost made the mistake of using burnt umber on her til I heard Charles Reod saying NEVER use anything darker than burnt sienna on a young model. The only place I used it was on the hair, the eyebrows and the eye. Of her left shoulder. I did manage to retain the whites on her right shoulder. 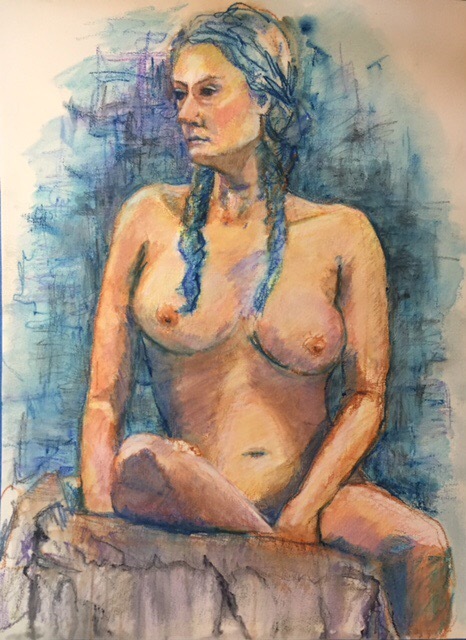 I sprayed the bottom of the girl and the drapery with my spray bottle to get a few runs in the caran d’ache. Always a fun technique. Colors used: flesh, pink, yellow ochre, burnt sienna, lavender, burnt umber. I won two tickets to the next theatrical at Chay Noir. It reminds me of a strongman posing at a sideshow. Started with my Noodler Ahab and filled I with my Pentel brush pen and my red Tombow. I am not really fond of any of these. Started with my Noodler Ahab and filled I with my Pentel brush pen and my red Tombow. Accents with my wink of Stella’s. I have a red, a black, and a gold one. ﻿The last pose of the night?! I guess she was tired. I know we were after more than ten sketches in a couple of hours. Our favorite art event of the month- the last Wednesday of the month at Chat Noir. Between crosshatching those buttons for hours and the rain I was NOT in the groove last nite. We did a bunch of one minute gesture sketches which are usually great but the model moved making them harder than usual. 1 minute gesture sketches. Was NOT in the groove. Pentel brush pen with a prepainted background in my Strathmore 500 mixed media journal. Finally she held still. I drew her with my Noodler Creaper Ahab which I love loaded with Carbon Platinum black ink. Things improved somewhat. But I only had red Tombow markers, a gold Pitt pen, and the Pentel brush pen. Poor planning. All the pink and red is done with the tombow. This took about 6 hours and is about 8×11 “. There are about 115 buttons. It’s almost impossible to count them. A friend asked me how do you do it? I told her one button at a time. I probably should not have ﻿drawn it I. Two three hour sessions. It could literally been drawn one button at a time whenever I had time. Fun exercise. Give it a try!!! And other fun ways to draw!! I have an extensive button collection. How many cans of them do I have? You don’t want to know. This is a few of them. It took three or four hours to draw and cross hatch them all. I was really pleased I didn’t have any ink smears like I usually do. For once I worked left to right. No pencil was used drawing the buttons. I did pencil I the letters so I could get them spaced out correctly. All that clean background paper demanded zero messes on the letters. I frequently get into trouble when I start scribbling all over the drawings like I am prone to do. Then I collage over the words. If you see a sketch collaged you can just about be sure theres a mess under the paper. Done with my Noodler Creaper Ahab on Strathmore 500 mixed Media journal paper. A Sbs assignment was to practice continuous writing. I think I did that. A quote from a funny friend on a blank page in my Handprint journal with a pink Varsity Pilot pen. This is the third attempt. The others follow. I learned that paper and pen does matter when writing these quotes. The handprint journal did not bleed like the Strathmore did when using a fountain pen. Varsity pilot pens again on another blank page in the old handprint journal. There were two blank pages because I really hate using watercolor in this journal though it is supposed to be watercolor paper. ﻿ ﻿Another Noodler on the Strathmore 500. It seemed to catch on the paper. This looked to be an easy exercise but it wasn’t. Just trying to space the writing out wasn’t easy. This is a great pen I got last week from Goulet so I really think half the problem was the Strathmore 500. Not smooth enough for calligraphy. The rest was this was harder than it looks!! Spacing the words out is hard when you have been programmed for years to quit writing after each word. 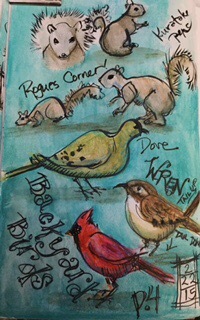 The fly page of a Moleskine watercolor journal. The paper was terrible to write on. But don’t you love the quote!? This is not done on the regular Wc paper in the journal but the back of the page that you wrote your name on. ﻿﻿Kilimanjaro paper with a Varsity Pilot Pen. Not bad. The pen liked the paper and didn’t stick to it like some of the others. I guess you could conclude that the paper has a lot to do with how easy it is to do calligraphy. If your assignment didn’t turn out well try another paper. Nothing unusual about that is there? Both of these are on Strathmore 500 Mixed Media and done with my beloved Noodler Creaper Ahab. I drew this last nite while I was watching Grantchester on PBS Mystery. Mystery is my favorite show on PBS. I just love Grantchester, and of course it doesn’t hurt that the hero James Norton is such a cutie.I wasnt wild about him in Murder at Pemberly….too foppish for me. 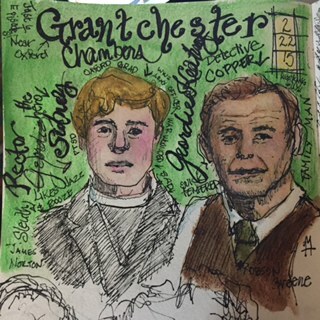 BUT in Grantchester he plays a wounded but sweet guy.I looked at his face and though as square as his face is its NOT hard to draw and I was right. His partner Robson aka Geordie was NOT as easy to draw though I think it looks like him. His face is too wide. I did draw him off the tv. His side kick Robson Green is not bad either. He’s been a favorite of mine since his show Wired in the Blood where he’s a profiler. Wired in the Blood is A VERY creepy show set in Scotland. Even my sons love it! I don’t seem to be able to leave them in black and white. I finally threw in the towel and colored it with my Caran d’ache watersoluble crayons. Was nice curled up on the sofa coloring and them painting with the water brushes. Some of the lettering in this version was done with the Kuretake- the heavier lettering. I have five of Kuretakes and rarely use them. I was so surprised because I kept adding words and the Kuretakes dried INSTANTLY. I painted over the lettering at the top immediately after writing it…usually a guaranteed bleed with my Pentel Brush Marker especially when its heavy like the word Grantchester. I think it got a little cluttered…I kept adding words to it as I thought more about the characters…I could have done a better job organizing it!! My faithful companion Zoe snuggling on the sofa while Mom aka me messes with the computer. I think I am drawing a dog everyday lately. Well most days!! Zoe is helpful laying next to me on the sofa.!! This one is still in black and white. I had just watched Andrea Joseph’s video in SBS…maybe where I got the idea for all the crosshatching?? Or maybe its because I drew her with the brush marker yesterday. I wanted to see what the Noodler would do with her fur…MUCH easier to draw and get good results. I dont know why people complain about their Creapers. I LOVE mine…had it four months without a problem. 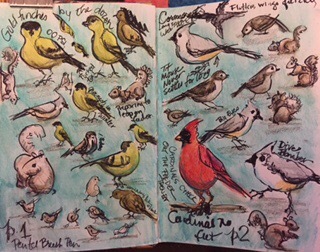 A grey rainy Sunday makes for a good day to draw the birds at the feeder. Two double page spreads and two single pages later I think I am done. One page of Zoe too. I was trying to get the hang of drawing with the Pentel brush pen making those fine lines Roz Stendahl gets with hers. Not easy. 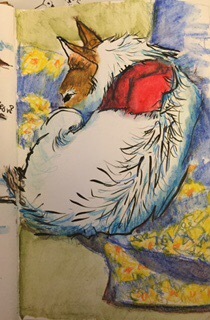 I drew two pages in the Strathmore 500 Mixed Media journal then changed to the Stillman and Birn Zeta hoping it’s smooth paper would make drawing with the pen easier. I even changed to a Kuretake brush pen by the page labeled p. 3 to see if it made it easier to draw fine lines. Kuretake pens, another Japanese pen, seemed to dry much quicker than my beloved Pentel brush pen which never fails to run when I hit it with water when I paint. The Kuretake did NOT run even if I got water on it right after drawing with it…VERY quick drying. FYI I bought my Kuretakes at Binders in Atlanta -the only Atlanta art store I have ever seen them in. The Pentel Brish Pen which is supposed to be permant is at all three Atlanta art stores but cheapest at Sam Flaxs in Midtown. Not being able to leave the drawings alone I colored all the pages in the Stillman and Birn Zeta but not the Strathmore 500 Mixed Media journal. All the pages were colored with Caran D’Ache watersoluble crayons which are such fun. Drawings were done with ink only…no pencil used. 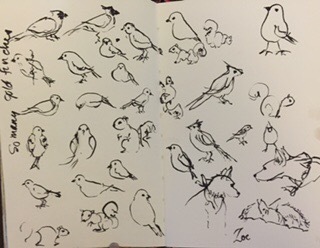 These are the birds done with the Pentel pen on Strathmore 500. It did seem to do a great job on the sketches of Zoe down in the right corner. First page in the Stillman and Birn Zeta still with Pentel brush pen. Some of this was done with the Kuretake pen. The chickadee with the smear is the Pentel brush pen …even an hour later it was still NOT dry. 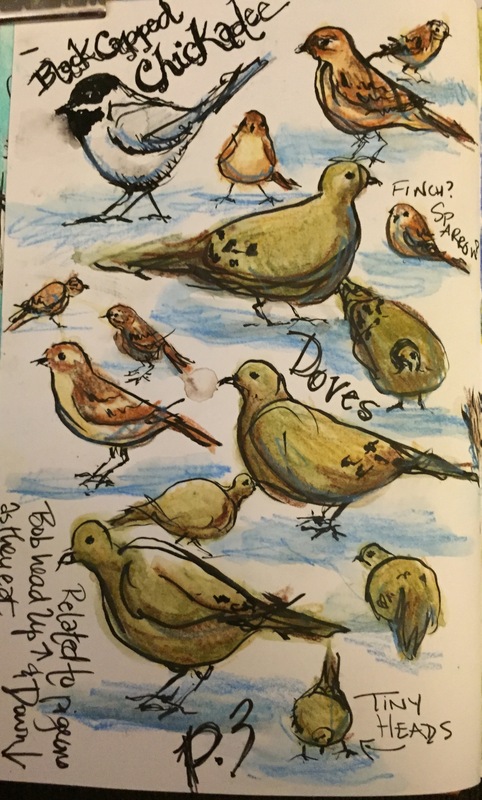 The doves stuck around for quite a while today. Like the gobbling finches and squirrels I am sure they were hungry. I have been going thru the bird seed this week – 10 lb so far. Drawing Zoe was so much fun with the brush pens that I decided to draw a bigger pic of her. I used both pens on her fur. I think it was easier to make the fine lines with the Kuretake. Whichever you use it really takes a very light touch to get a fine line. I DONT have a light touch whether it’s pen or pencil. MORE practice required!! Not as full as the other pages. I needed a nap after I did this one. It was beginning to pour and only the bravest animals were at the feeders by then. Did the pen make a difference?? THe Kuretake was definitely faster drying and much more waterproof than the Pentel. I hate to tell you how many times I have had the Pentel bleed HOURS after I drew with it. Try the Kuretake pen, a disposable pen, if your Pentel brushes are giving you trouble. Maybe the bristles are a little stiffer?! As one of my first graders Dresean once told me That’s all I got Miz Hunt!! Did the papers make a difference?? I really couldn’t tell that it was easier to draw with the brush markers on the S&B or the Strathmore 500. Maybe I need that Japanese journal Roz raves about on Roz all wound up?! HMMMM. Went well today. Only 134 days left til I have blogged daily for a year. Starting to sound doable. 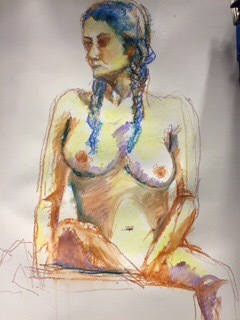 Today was life drawing at USA Aiken and the lovely Elena was our model. She’s been thru quite a few stages. This is where she is now though thinking of lightening her right eye. I think it’s still a little dark. Here’s how she looked after the first twenty minute break. That lemon yellow caran d’ache had been calling my name and saying use me use me!!! My friend Ruth said she didn’t like the yellow and could I make her peachier. Ruth is usually right so I did. I also needed to lighten the shadows on her face which was making her look too old. I lifted the shadows with a good stuff hogbristle oil paint brush and blotted off with a bounty towel. That#140 Fabriano Artistico is tough paper. Always amazes how you can wipe off the Fabriano. I also had to narrow her right shoulder and lift both of them up a bit on either side of her neck. I love that hogbristle brush. It lets you do the lifting of color a smidge at a time. Terribly cold here today and I cant stay home. Ten degrees with the wind chill this morning and it will be that bad tonite. Somebody send some warm air back. 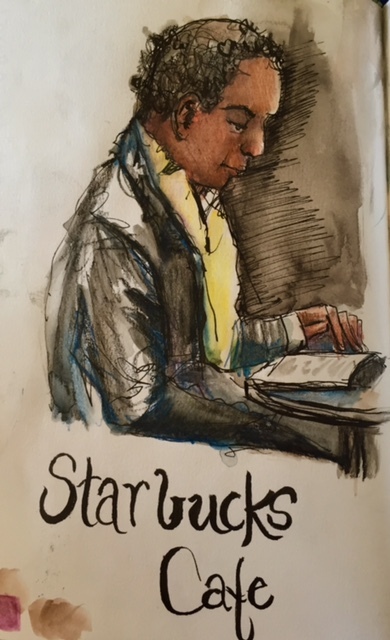 I drew this at the Starbucks at the local Barnes and Noble a few weeks ago. I really need to go again. You really begin to know alot about the people you sketch if you sit there and collect drawings like I did on this one. The young girl was on her cell phone though I thought she looked a little suicidal with her hair in her face all dressed in black. I was relieved when I noticed she was on her cell phone. The old guy was talking animatedly about taxes. Groan…dont want to hear about taxes!! 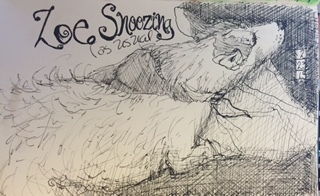 A very fast sketch that I drew while Jan checked out at the Hampton Inn in Valdosta. I really like its chunkiness…almost an abstract. Always a favorite of mine it was NOT well received on Instagram but I still like it anyway! 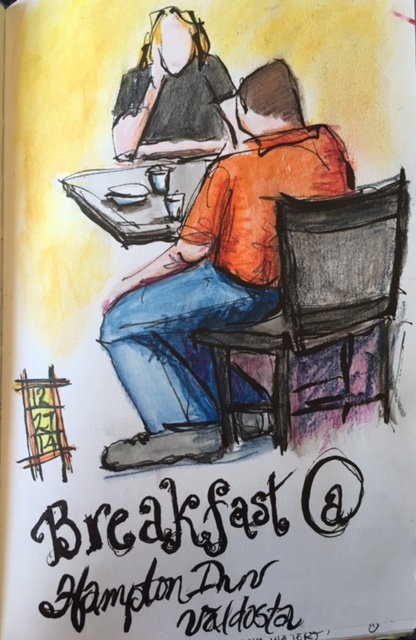 This was sketched as I sat in the middle of a room of people eating breakfast busily walking by me checking out and getting coffee. No one seemed to notice what I was up too…there are two more pages!! This should have been in my Key West sketchbook. It started as a double page spread but I never finished the other page so it never got finished. 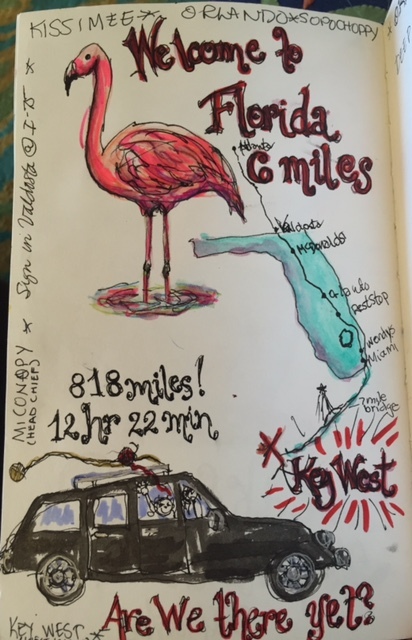 I dont know if you have ever driven from Atlanta to Key West but its a VERY long LONG trip!! I guess I will finish the other page when we go back this summer!!! 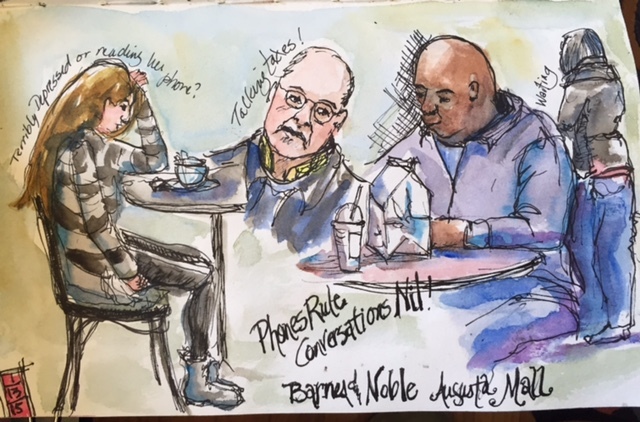 This well dressed older man was sketched at the Atlanta Starbucks in Edgewood Barnes and Noble.He had such long fingers. I also have his hadn drawn somewhere else…Hands can give you fits and do require PRACTICE! !